Something has been tearing down fencing and killing livestock in a small town in the Australian outback. The crazy drunken locals say it’s something completely outlandish. Debbie (Simone Buchanan) and her family are going for a getaway and to help out her brother Bernie (Nathan Jones) with his ransacked farm. They just walked into the deadliest boar’s nest you’ve ever seen. They grow them big down under. Anything could be living in the large open terrain of Australia outback where no one can hear you squeal. Director Chris Sun’s latest horror is a giant outback creature feature. In true Syfy channel fashion, Sun takes an animal of the outback, injects some growth hormones, sends it on a killing spree and calls it a horror film. Sign-up Australia’s biggest horror name John Jarratt of Wolf Creek fame, Australia’s largest former WWE superstar turned actor Nathan Jones and American horror icon Bill Moseley of The Devil’s Reject’s and Texas Chainsaw Massacre series. Everything is set up for success right? In a movie named Boar, about a killer boar, you’re banking on the star of your movie being the boar. 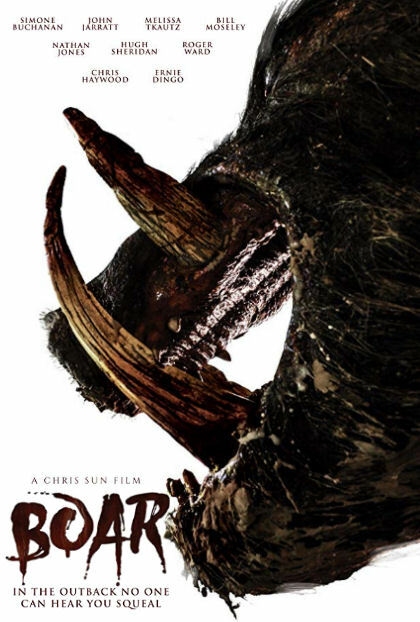 Boar brings the gore in a mix of practical and CGI effects. The practical effects include a large boar head that looks pretty good but is as immobile as the shark in Jaws. The boar stare-offs work but could have been shortened to make an immobile prop look more active. The majority of the boar bites leave something to be desired as the actors just lay their body parts in the large boar mouth. CGI needs a complete overhaul if this movie wants to get any release better than the next Syfy original. Animated effects range from smaller animals, decapitations and blood and gore. Some of it is done quickly to cover for the lack of a CG budget while other shots, particularly the ending, linger and look completely unreal, taking you out of the film. One thing the movie doesn’t go light on is boar gore which is abundant. With the Boar a bust we turn to our performances to carry this movie. Simone Buchanan easily stands out as the film’s most realistic performance followed by the other blonde bombshell Melissa Tkautz. Oscar (Ricci Guarnaccio) is so over the top annoying I just didn't want to watch him which I guess is the point. Unfortunately he outlived some characters I liked and didn't bring me satisfaction with death. Nathan Jones’ dialogue may be limited but by the end of the film he’s the Giant Man vs Giant Boar you’ll be rooting for. Bill Moseley is very memorable in a performance I really liked. While it’s a nice change to see him play a regular but somewhat subservient father figure, it’s not the badass Bill we’re used to and that fans will want to see. At least it was more than a cameo to get his name on the marquee. A killer boar movie should be simple but Boar struggles with direction in its script. Dialogue seems elongated without purpose with homage paying lines to previous films that aren’t needed. The real killer is the CGI though. With a better CG budget I could have had fun with the concept but with what they’ve currently produced it’s a movie regulated to those who enjoy Syfy originals.